February is International Therapeutic Recreation Month. Therapeutic Recreation (TR) is an allied health profession which focuses on improving a person’s physical, cognitive, social, emotional and leisure needs through activity interventions. A Certified Therapeutic Recreation Specialist (CTRS) typically plans and facilitates an activity for their client and ensures that certain skills are practiced and goals are achieved during the session. Recreation Therapists can be found working in hospitals, long term care facilities, school systems and even parks & recreation departments. You can also find Therapeutic Recreation being used by Imagine!’s Out & About department. Out & About uses Therapeutic Recreation theory and methodology when developing each activity and also when creating each participant’s individualized Therapeutic Plan. 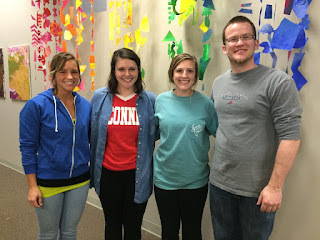 To celebrate International Therapeutic Recreation Month, I would like to officially welcome Out & About’s four therapeutic recreation interns for the 2016 Spring semester. Ally joins us from Metro State University, Elizabeth is from University of Wisconsin-La Crosse, Sammi comes from Indiana University, and Sam is from Winona State University. Welcome to Imagine! and Out & About! The new interns are likely already having a rewarding experience as they put what they have learned into practical experience. But don’t take my word for it, check out a couple of videos below from previous interns discussing their time at Out & About.